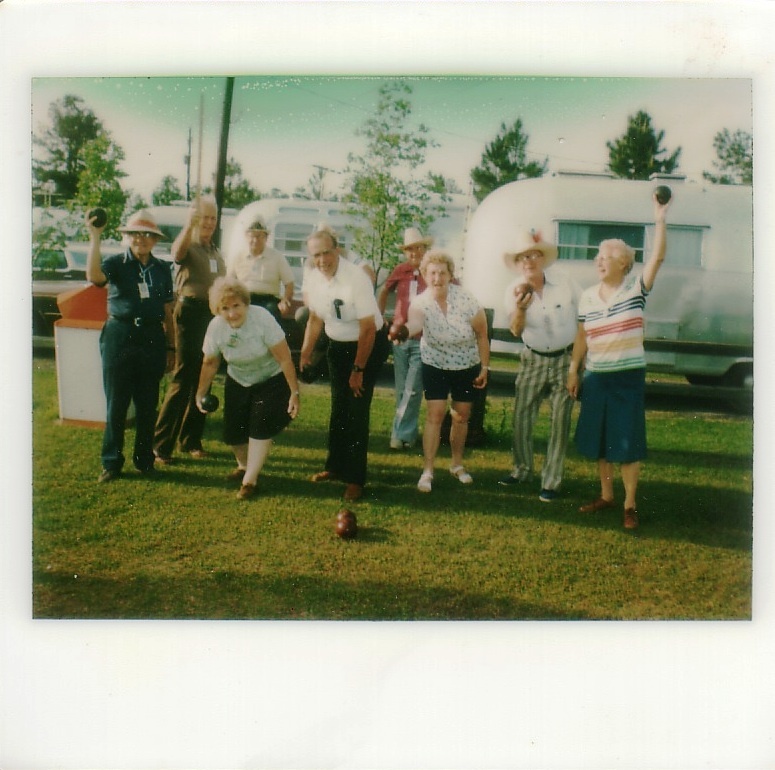 From time to time I am lucky enough to receive some family photos from a friend or Airstream Life subscriber, showing their parents and grandparents (and sometimes great-grandparents) having fun with their Airstream. I always treasure these, and sometimes we run them in the magazine. The pictures are often blurry, out of focus, or the colors have faded over the decades. The slides have scratches and the handwriting on the prints is illegible, but all that seems to only increase the quaintness of the photos, which seem to capture a very simple and fun time. Of course, that’s an illusion, since when the photos were taken people had things to worry about too. Instead of a mortgage crisis and war in Iraq, they might have been taking a break from the Cuban Missile Crisis or the Vietnam War. Not much has changed when you look at it that way, and even the Airstreams look pretty much the same at first glance. But in the images all seems to be well. People are enjoying the good things in life: family, friends, a sunny day, a moment away from the care of everyday life. They don’t need much in these photos to appear to be having a good time. No satellite TV here, nor major theme parks. The novelty of buying a pineapple or having a friendly chat over a haircut can be the center of a good time in vintage photo-land. These photos seem very precious now, since snapshots were less common then than now, and since so many of them have not survived. Certainly tens of thousands more are stored in attics all over the world, and once in a while they pop up on eBay. Two years ago a large collection of Ektachrome slides came up from an estate sale, and since (judging by the slide description) the photographer was an Airstream owner who had gone to Mexico on a caravan, I bought them. I was hoping that out of several hundred slides I might find a dozen or so worth keeping. In the end, only about five were really of interest, and even those were marginal. It’s a gamble trying to buy old slide collections, but I keep looking. The best collections come from second and third-generation Airstream owners. 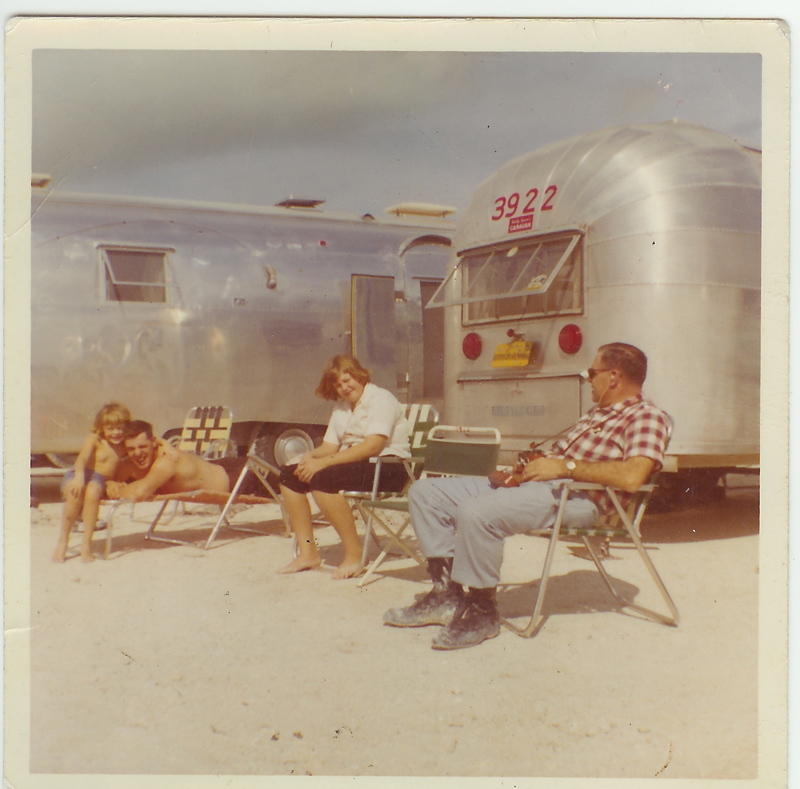 They know the historic value of their grandparent’s photographs, and when they offer a set to me (usually in the form of scans, which is fine), it’s always a great collection of candids that portray Airstream travel as it really was. In addition to the usual beauty shots of gorgeous landscapes and overviews of rallies, people chatting and people playing, I will see images of people doing mundane daily tasks like eating dinner, or digging a hole for the sewage. There’s an aspect of honesty in these collections that I can’t get from official publicity shots, even though the staged images are usually more photogenic. I mention all this for two reasons. 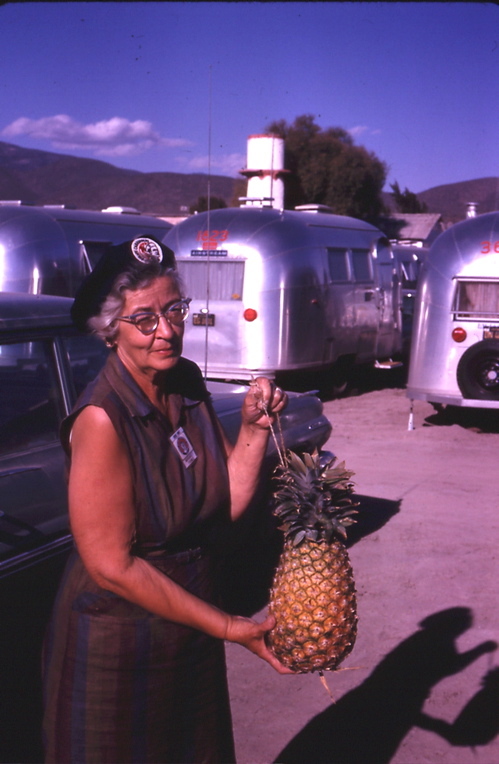 First, I’d like to encourage people to send their vintage family photos to me for the Airstream Life collection. I’d like to run more in the magazine, but finding good images is a challenge and I need your help. Second, keep in mind that a lot of the snapshots you take today will be invaluable to your family decades in the future — even some of the more boring ones. Your kids will look through the shots of themselves camping and remember mostly the good times. You will always look at yourself in the photos and think “How young I was then!” And perhaps someday something that seemed commonplace when you took the photo will be extinct or nostalgic, and the photo you took will be a record of it. Even thumbing through the images we took as recently as 2003 (when we bought our first Airstream), all three of the above things have happened to us. Your Airstream is a time machine. It connects you to the 70+ years of Airstream history and your own family’s history. It may be a bit different from the ones of the 1950s or 1960s, with a flat-screen TV and a satellite radio, but the aluminum body and carefree lifestyle it enables remains exactly the same. Next time you’re out in the Airstream, think about the history you’re making for your family or yourself. Photo credits FIRST: (Unknown). SECOND: Marathon FL, 1962. 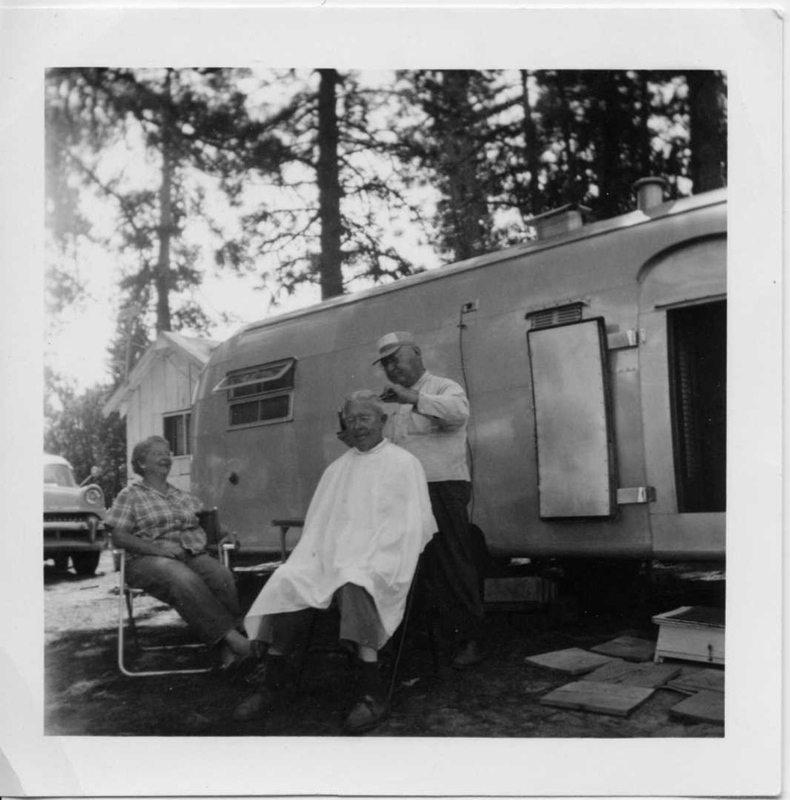 Courtesy Rob Baker, THIRD: Bert Richter gets a haircut from F. Brick during the 1958 Western Canada caravan. Courtesy Herb Richter. FOURTH: Mrs. LaVergne and her pineapple. Courtesy her grandson Thomas LaVergne. Two and a half years of roaming around the country in the Airstream, and I’ve never lost my phone. Not even for a few minutes. But a couple of months sitting in the house and suddenly it’s gone. I remember talking to Colin Hyde this morning for a while. We were discussing the Vintage Trailer Jam and how we were going to solve electrical challenges at the event. The phone usually goes right into my pocket after a call, but this time I don’t remember what I did with it. I know I didn’t make or receive any calls for the rest of the day (unusual in itself), and then this evening when we went to the local used bookstore to trade in some books, I realized I didn’t have it. There are too many places the phone could be, especially in the mess of a house undergoing renovation. I spent forty minutes turning over boxes and re-tracing my steps before conceding it was not here. In the Airstream, if something was lost it could not remain lost for long, because there simply wasn’t enough space for something to be without getting in the way, and thus being discovered. To my mind this dilemma is the direct result of having too much house around me. But that excuse reminds me of A.A. Milne’s story of Winnie The Pooh being stuck in Rabbit’s door. Perhaps Rabbit is right and it is really a matter of just being fluff-brained, like Pooh. Things do get lost in Airstreams, I’m sure, but it takes real effort. 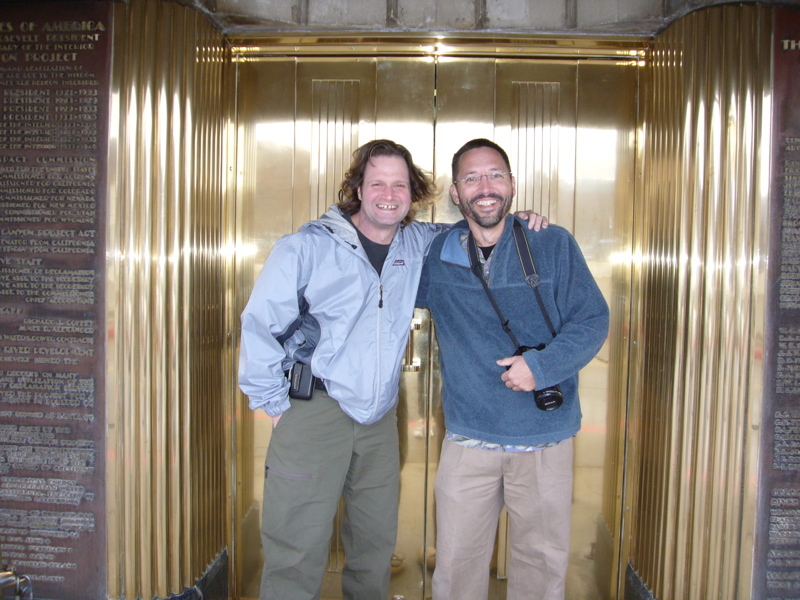 I remember last winter when Rich C and I were camped in Tucson (this was before we bought the house). In a distracted fit of cleaning, he managed to put his cell phone in the trash, take the trash out to the dumpster, and only after the trash truck had emptied the dumpster 30 minutes later did he figure out what he’d done. By then the phone was halfway to a landfill, no doubt bleeping plaintively all the way. I accompanied Rich on the drive over to the Verizon store to get a new phone. It was a long drive of self-remonstration, as I recall. I didn’t try to soften the blow for him either, agreeing with him every moment that he was a total doofus for tossing his phone in the trash. (That’s what guy friends do.) But his experience proved one thing: you can indeed lose a phone in an Airstream if you try hard enough. The phone is an essential lifeline for full-time travelers and I would not be without it, even if I wasn’t working. That’s why we have two, and we keep them on separate networks. With two different networks we often find one phone works when the other doesn’t, giving a sort of redundancy and a slightly higher level of reliability. Being without mine feels like the time I sent in my camera for a week’s service. It’s one of my three essential tools: laptop, camera, and phone. With them operating normally, I can do anything — without them I feel naked and disarmed. At this point I have to conclude that the phone is either quietly dead somewhere or beeping the “missed call” warning from deep in the cushions of a comfy chair at Bookman’s. I hope it passes a pleasant night. I’ll give the store a ring in the morning — from Eleanor’s phone. For most people, including us, it is a challenge to revise your earth-bound thinking to the world of full-time travel. There are so many presumptions that you have to toss out: the presumption of never-changing utilities (power, water, sewer, trash); the expectation that you’ll wake up every day and know where you are; the reliability of a weekly schedule. But the process of tossing out those presumptions is very liberating, once you get the hang of it. As a full-time traveler without a house to maintain, you can focus on yourself rather than the structure around you. No tax bill, no mortgage, sure — but what about never having to sweep the front walk or paint the eaves? Ah, those were the days, but we are now on the flip side of that, having come back to a house and finding ourselves completely immersed again in household duties. Suddenly it seems there is no time to do anything but take care of the next house-related task. OK, enough of that. My point is simply that homeowner-hood has taken over my brain and suddenly things like this not only matter, they are the top thoughts in my head. I am having actual concern about trivialities like leaves that blow into the carport, and decades-old cracks in the backyard wall. I am picking palm tree seeds from the gravel, and washing bird droppings off the windows. My number one goal this week is to — gasp — go shopping, for stuff like mattresses and chairs. What has happened? Did someone slip a double Prozac dose into my raisin bran? In all this, there is no room for thoughts of adventure. I remember (vaguely) a time when we would awaken to draw back the bedroom curtains and be reminded of where we were that day. Then we’d grab the national park map and guide and plan a day of hiking, or sightseeing. Or we’d go walking around to explore a rally, or just open the windows and let the local smell (salt air, green forest, desert breeze) permeate the Airstream. I’d still have to do some work every day, but other than that my thoughts were of what we could do next to have fun or expand our horizons. Rarely did I think about cleaning or maintenance, and never about mowing, planting, or painting. Well, in Tucson mowing is still low on the priority list, fortunately. So it’s not a total setback. But I am plagued by an emotion borne of homeownership: envy. I am horribly envious of my friends who are all in Anza-Borrego Desert State Park having fun. Other friends are getting together in Quartzsite this weekend. Worst of all, several of them have made piteous comments designed to make me feel better, like “Yep, I’ve been landlocked by my house too,” and “Don’t worry, someday you’ll get back on the road.” I want to be on the road now! If I sit here too much longer I may turn permanently green, and I don’t mean in the eco-friendly way. I am ticking off the tasks that have to be completed before we can go. This weekend we are expecting Handy Jerry to come by and deal with some “punch list” items on the house. More interestingly, we will get delivery of our couch. (That might not seem like a big deal but it is to people who have spent a lot of time cross-legged on the rug lately.) And Emma has her big karate test on Saturday. This is all good, but it means yet another weekend stuck at home. These tasks are passing by like a line of traffic on the highway. We’d like to get our chance to pull out, but they are so evenly spaced that we never seem to get a break. As soon as we see a break of four days or more in the schedule, we are going to hitch up and go somewhere — anywhere. And if we can’t see a break, we’ll make one. We’ll just schedule all the final tasks for the last two weeks of the month and take off between now and then. It’s risky, but worth a shot. That should get us out of homeowner-think and into mobile-think again — not to mention enlivening this blog a bit. Homeownership can turn you green. The best thing about Tucson is that lawns are optional. Toto makes a really great toilet. Keep all that in mind. There will be a test later. At the moment our life feels like an endless stay at the airport. We’re awaiting a flight out but it never comes. This weekend I was mentally rejuvenated by going to Las Vegas and hanging out with good friends. I came back to Tucson with a new perspective, and feeling ready to get the house project done. It’s a good thing too, because the news has gotten worse and worse, and without a break I might really be depressed about it. The story behind this is too tedious to detail. Suffice to say that our countertops will not be installed until late in March, which means we won’t have appliances or sinks until nearly April. We have a choice: we can blow off the house and leave it unfinished, to be resolved this fall, or we can blow off our schedule and stay here until the house is at least habitable. We’ve decided to stay, sort of. This means a major disruption to the schedule that I had posted about a week ago. The worst thing is that we will miss the Heart of Texas unit rally in Ft Davis entirely. We’ll also have to shove our scheduled stops in Weatherford, New Orleans, and Florida back about three weeks, and cut some other stops out entirely. Nobody is happy about this. But there’s no point in agonizing about it. If we left things unfinished here we’d only be coming back to a project in October or November, and we don’t want to face that again. We want to come back to a house we can enjoy, not a project that drains our energy. 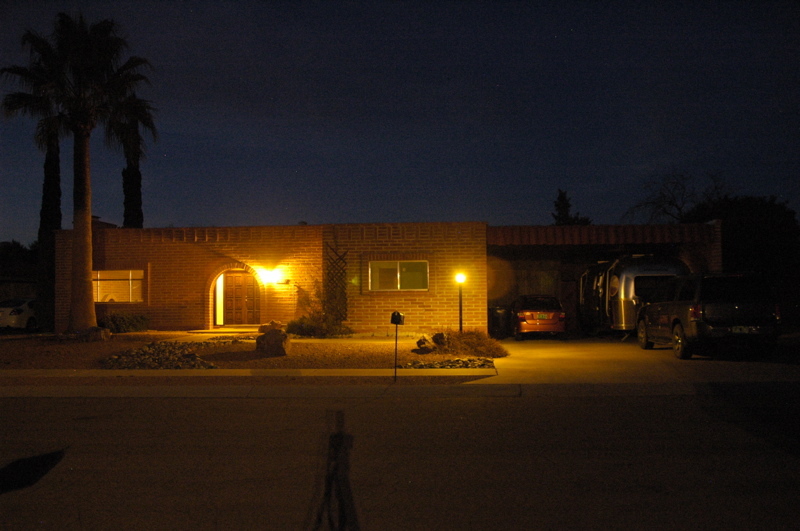 The whole point of having a house was to have a comfortable and relaxing place to land between trips. The only way it can fill that role will be if we get it to a point where we can settle in when we return. This is not all bad news. Since we have little to do in the house during March, except wait, we will look for an opportunity to take a shorter trip for a week or so between projects. This means we can re-visit the idea of going to Sonora with some friends who have expressed interest (and who happen to have spouses who are native Spanish speakers). We can also do some long weekends in southern Arizona at places that weren’t available to us during the coldest part of winter, like the Chiricahua Mountains. I wish we could take off this week and join our friends at Anza-Borrego. As it turns out, several of our friends are coincidentally going to be there this week, including several characters you know if you’ve been reading this blog regularly: Bobby & Danine; Bill & Larry; Rich C and Sadira; and Jay and Cherie from Cheyenne. It sounds like a party — and we can’t go! One happy reason that we can’t go has to do with Emma. She has made such tremendous progress at karate that she has achieved three stripes on her white belt. Her instructors have decided that this Saturday she will test for her yellow belt, which is a real compliment. Normally it takes at least three more weeks for a kid of her age to be ready for that test. To be ready, she has to learn some more phrases in Korean, study some rules, and learn one more new form. So this is a critical week for her. The moral of the story is that delays happen, in any kind of traveling life. Long ago we learned to stay flexible. It will be a huge drag to miss our friends at the Fort Davis rally, but every setback opens up a new opportunity. It’s sort of fun not knowing exactly where or when we will be going, but having confidence that something interesting is about to happen. One way or another, we are going to get this Airstream back on the road. And we’ll find our friends again at some point. Like us, they are irrepressible travelers and they will pop up, sooner or later. Once we get a few details squared away, I’ll post a new schedule here. Right now only know that we will be back in Vermont by June, and attending the Vintage Trailer Jam in Saratoga Springs NY during July 10-14. The rest is unknown … and as long as it is, I’ll enjoy the sensation of anticipation and the thrill of all the possibilities that lie ahead. Perhaps this “delay” thing isn’t going to be so bad after all. First off, I’ll end the suspense. I got killed in the poker tournament. Went out early, after about 90 minutes. Leigh went out halfway and Brian finished fifth, which means that none of us got a penny. Oh well. I had a very interesting time and didn’t regret the experience. 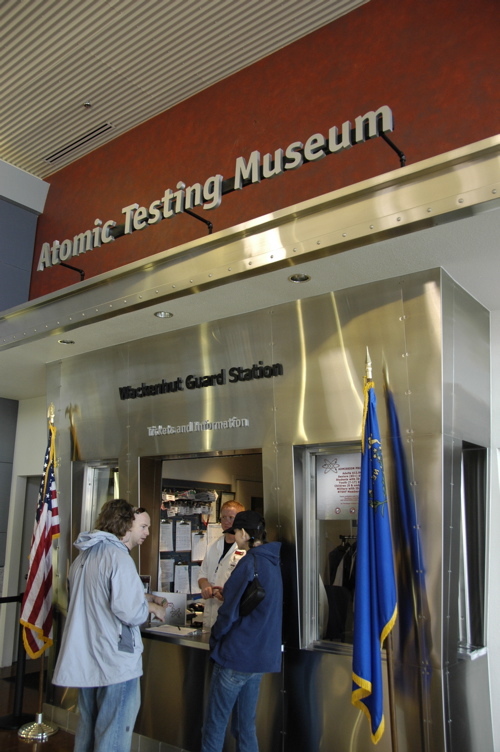 Adam and Susan came by for the last few minutes of the bloodbath and then we shuttled down to the Atomic Testing Museum (on Flamingo, just a short walk from The Strip) to explore the fascinating and occasionally bizarre history of atomic testing in Nevada and other places. You might think that the museum is dull, but I can testify that it is really very good, with top-notch exhibits. Well worth the $12 admission (cheap, by Las Vegas standards) if you are even a little interested in the topic. The pirate-actor-stuntman I met on Saturday night at the home game arranged for Adam, Susan, and I to get a VIP spot for the 5:30 pm show “Sirens of TI“. 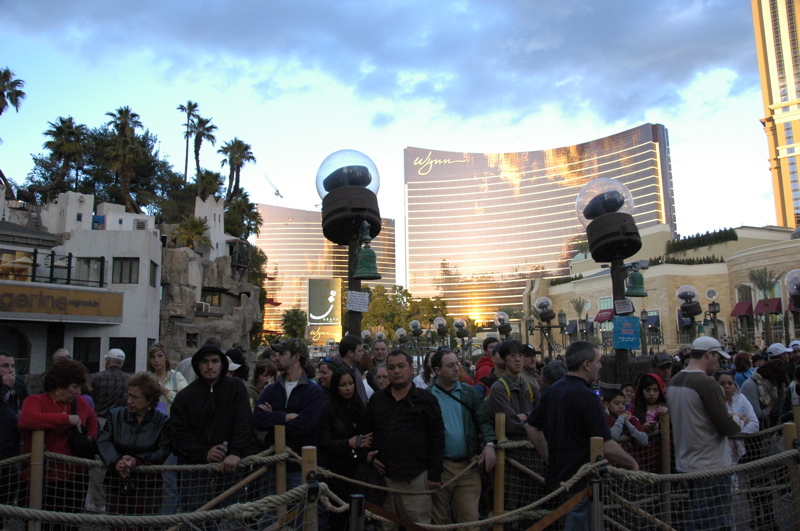 This is the big pirate show that they do outside by Las Vegas Boulevard every night. There’s always a huge crowd out there, and so VIP spots are really a huge bonus. Sadly, wind prevented them from running the show. The show features a lot of pyrotechnics, and so they have had to cancel several performances lately. Our program for the last few days has been to walk around a bit and then find a coffee shop in one of the hotels to sit and have a chai latte. In the big hotels, this costs about $5.50, but the people-watching entertainment makes it well worth the price. From my minor survey over the last three days, I’ve decided that that the chai latte is best at The Venetian, 2nd best at Paris, and the new Wynn — although a beautiful hotel — runs a distant third. It’s an utterly irrelevant comparison, but in a place where superlatives rule, and excess is considered normal, such minor comparisons are sometimes the only way to tell where you are. I have done what I came here to do, and it’s time to head back. On Monday I’ll make the drive down to Tucson and re-join the family on the house project. The news I’m hearing from there suggests we may have to push back our departure from Tucson as much as two weeks. This is not welcome news, but all is not yet finalized. We’ll know more soon. I’m getting behind on the blog because there is so much going on each day. At this point I’m trying to catch up with what we did on Saturday. It’s all becoming a blur of activity. In the morning I took Adam and Susan up to Red Rocks National Conservation Area, which is in the hills just west of Las Vegas. I’ve wanted to go there for years and for some reason it has never worked out until now. The Conservation Area is really at the level of a national park. The views and hikes are stunning, and there’s a 13-mile loop drive that gives you a great summary of the place. We did three short hikes, totaling about five miles, and caught a few highlights including the visitor center, some pictographs and a waterfall. The park was magnificent and the hikes were fun, but in retrospect it was a bit of a mistake to do so much in the early part of the day. I dragged myself back to the house around 5 pm and found Brian & Leigh arising from a nice two-hour nap. So when guests began to arrive at 7 pm for their Saturday night poker game, I was certainly not at the top of my form. Nonetheless, I survived until midnight and even came out ahead in the game. It was a fun evening with some great people. 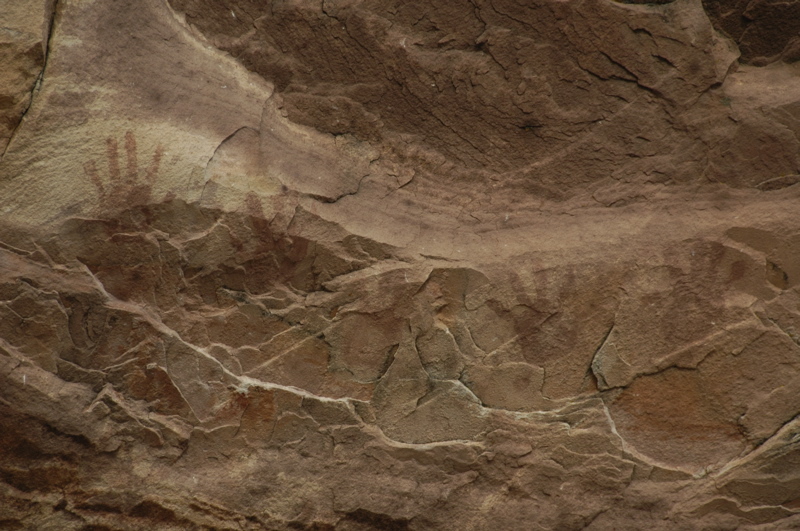 Four were new to Las Veegas, and two were lifelong residents. One was a pirate/stunt man in the Treasure Island show. One was a reporter for two websites (one his own). It made for a lively night. At the end of the evening, Leigh and Brian pronounced me fit for the Sunday morning poker tournament. I’ll tell you how that turned out on Monday. I’ve met up with good Airstream friends Adam and Susan here in Las Vegas. Since Friday turned out to be a quieter day than I expected, I was able to take the afternoon off and go with them to Hoover Dam. It’s only about 30 minutes from Las Vegas. I’ve blogged the dam before, and taken the tour, but I have to say that it is a thrill to visit even the second time. 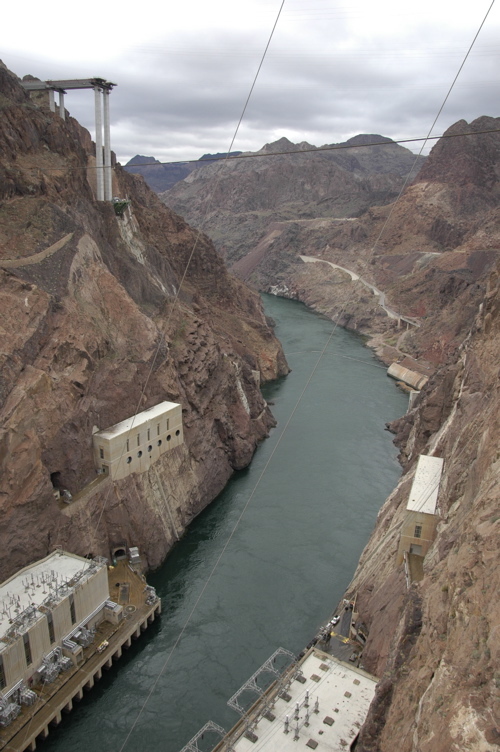 Uncharacteristically, Black Canyon (where the dam sits) was filled with low gray clouds and frequent rain. It was still beautiful to see, perhaps even more than usual, with the fog drifting through. I hadn’t noticed before how much of the interior architecture is Art Deco styled, nor that there’s actually a Men’s Room with terrazzo floors built into the top of the dam. Visually, a lot in this area is beautiful, or at least colorful and interesting. It’s a great place to take pictures. 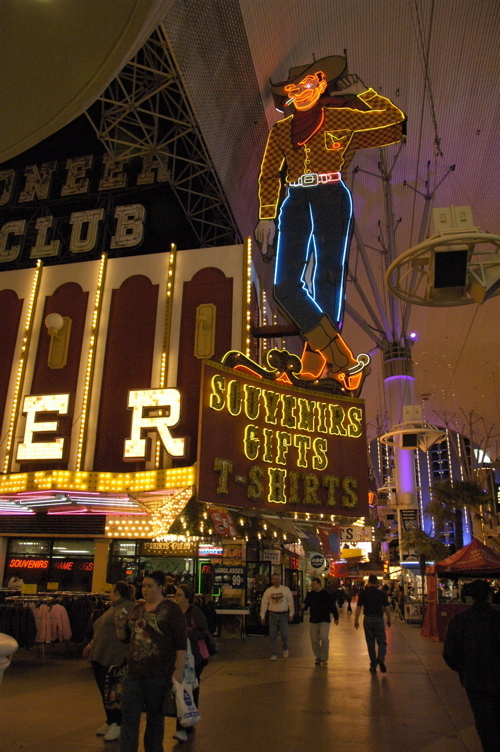 So I’m going to create a new Flickr photo collection for some of the Las Vegas images I’ve captured this week. See it here. Brian and Leigh have continued to give me some training at poker, and I’m going to give their lessons a test tonight. They have invited about eight people over for a Saturday night “home game”. If I fail, it will be because they didn’t teach me well, and if I succeed it will be because I am brilliant. (Just kidding.) It will actually be just a fun evening with some new people, and Brian and Leigh are excellent teachers regardless.